Sinn Féin President Gerry Adams is the latest addition to our Northern Ireland Peace Process exhibit in the Time Vaults of Irish History. The Time Vaults of Irish History detail important events in Irish history down through time, from the Vikings right up to the Good Friday. These exhibits are appropriately housed in actual vaults and detail important events from Irish history. 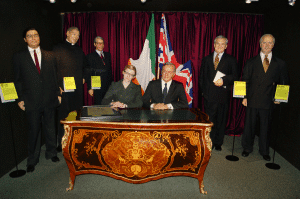 Our Northerh Ireland Peace Process exhibit is a tribute to those involved in the signing of the agreement, which paved the way for modern day Northern Ireland and an end to years of violence in the region. The exhibit features many of the prominent figures that were instrumental in creating the agreement from both sides, and includes a replica of the signed agreement.